November, as any self-respecting online bargain hunter would know, is an exciting month of online sales - on Saturday, the Singles' Day or 11.11 sale takes place, followed by Black Friday on Nov 24 and Cyber Monday on Nov 27. These events have been growing in popularity year on year, so much so even brick-and-mortar retailers have rolled out their own editions. For the first time this year, department store Metro is holding a Singles' Day sale on Saturday, offering buy-one-get-one-free deals as well as 20 per cent discounts for card members. And for the second year in a row, it is holding a Black Friday sale from Nov 24 to 26, offering up to 75 per cent in discounts. During Black Friday, it will open its Paragon and Centrepoint stores at 7.30am and provide breakfast - including coffee and chocolate muffins - until 10am for its early-bird shoppers. "The retail landscape is changing and we are constantly evolving to keep up with the trends and to stay relevant," says Ms Peggy Tan, Metro's marketing manager. Department store Robinsons is also organising 11.11 and Black Friday sales across its three stores as well as online. Since these sales coincide with the year-end festive season, they are appropriate for those looking to do their Christmas shopping, says a Robinsons spokesman. Drugstore chain Watsons is holding its 11.11 sales from now until Wednesday on its website and app. And this year, MAC Cosmetics and The Body Shop have joined Lazada's platform in time for its Online Revolution sale, in hopes of increasing their online reach. Download your favourite websites' apps and browse the products to see what deals you want to snag. Pre-load your shopping cart so you need only click "checkout" on the sale day. Remember to enable your app notifications so that alerts on good deals pop up. Many sites let you label products that have caught your eye as favourites or starred items. For example, Lazada has a wishlist function on its app where shoppers can keep track of what they want. "By doing so, you get up-to-the-minute alerts on the best deals for the products you've picked," says Lazada's group chief commercial officer Robin Mah. Consider using cashback sites such as Shopback, which allow you to get cash back if you buy items through them, says avid online shopper Tan Yien. Cashback amounts can range from 5 per cent to 20 per cent of an item's price. You can save even more by using selected credit cards, depending on the deals each site offers. Remember that time saved may be worth just as much as money saved. Some sites offer custom delivery systems such as Qoo10's popular QX Quick Delivery, a three-hour express service that lets customers pick their preferred delivery times. Compare sale products and prices across various sites, says Ms Tan. "Let's say I'm buying a fan - it may be offered in different colours at different prices on different sites," she says. Gather your friends to make bulk purchases. This way, you can take advantage of group-buying discounts, Mr Mah recommends. Even heartland family businesses and smaller mom-and-pop shops are looking to cash in on the action. These include shoe stores Mimosa and Dr Kong, industrial power tools store Teck Cheong Hardware, camping equipment store Winning International and baby and nursing products store Mums & Babes. E-commerce platforms such as Qoo10, Lazada, Shopee, Taobao, ezbuy and Zalora are bracing themselves for when the online sale season flags off with 11.11. "As consumers' needs continue to evolve rapidly, more retailers are beginning to understand the value of adopting an omnichannel retail strategy," says Mr Zhou Junjie, Shopee's Singapore country head. Consumers are shopping more online and since "it is difficult to develop a high-performing Web infrastructure from the ground up, many retailers turn to platforms like Shopee", he adds. The platform saw a 35 per cent increase in the number of seller sign-ups in the month leading up to its 11.11 Shopee Super Sale, 40 per cent of which have a physical retail presence, says Mr Zhou. He adds that the number of sellers with brick-and-mortar stores on the platform has increased by 60 per cent this year, compared with last year. To prep for this month's sales period, Qoo10 is extending its retail space into the physical world, with a fair at Suntec City's atrium and 20 merchants setting up booths selling beauty, food and lifestyle products until Sunday. Mr Hyun Wook Cho, Qoo10 Singapore's country manager, says that about 80 per cent of its sellers operate physical stores and that more merchants now let customers pick up purchases at their stores. The November period means bumper sales for Lazada, whose Online Revolution sale offers discounts of up to 90 per cent. During this period, says Mr Alexis Lanternier, chief executive of Lazada Singapore, the orders placed on key sale dates can go up to 10 times of a regular day's. This year, the site has more than 5,000 participating local sellers for the sale, twice the number compared with last year. Piano teacher Tan Yien, 28, says she gladly welcomes the arrival of more traditional brick-and-mortar stores to the online sale period as this means more options for shoppers. The mother-of-two regularly buys household products and groceries such as diapers and milk powder online and shops at sales looking for discounts, promotions and freebies. She particularly enjoyed a 11.11 sale last year that featured "surprise boxes" - in which shoppers could get a hundred dollars' worth of mystery brand-name products in a box for $29. "That was quite fun because of the surprise element." The only thing to be wary of, she says, is that during such sales, there may be delays in shipping due to the volume of orders being dealt with. To try to revive a declining business, women's shoe store Mimosa is hedging its bets on this month's online sale season as well as its venture into e-commerce. For the first time, the shoe store, with six outlets here, is participating in 11.11 (Nov 11), Black Friday and Cyber Monday - through e-commerce platforms Lazada and Qoo10. The brand's director, Mr Ong Soon Keat, 41, says he decided to jump into the fray this year to see how effective online sales events are. "Sales at our retail stores have been slow for the past few years. This is a good opportunity to boost our sales. Customers are drawn to online platforms on these particular days," he says. The brand started selling its wares on Lazada and Qoo10 this year. "We used to serve younger customers, but now, we see fewer young people in our stores. We realised they are now shopping online and that we had to go online and reconnect with them or we would lose them forever," says Mr Ong. But although online sales have been encouraging, he says the brick-and-mortar stores still make up about 97 per cent of business. Mr Ong, who left a career in teaching, opened the first Mimosa outlet with his wife and her parents at Far East Plaza in 2007. "At the time, that was where all the young people hung out. Business was good then," he says. At their peak in 2012, they had 11 stores, six of them in Far East Plaza alone, under the names Mimosa and Covet. But shortly after, trade started to decline and the stores shuttered one by one. Determined to turn things around, Mr Ong took a series of e-commerce courses in June and even made a trip to Chinese e-commerce giant Alibaba's headquarters in Hangzhou in August to learn about its operations. That was when he realised just how big the online market is. "The potential is there," he says. "You really have to differentiate your products from the rest. Once you do that, pricing is not an issue." Online sales such as 11.11, Black Friday and Cyber Monday, he says, help to increase brand visibility, especially among younger shoppers. Mimosa will be offering $11 deals on its shoes, usually priced at $12.90. This means not turning a profit on the items, says Mr Ong, but he hopes the exposure will be worth it. After all, the father of two expects average daily sales to triple this month. Despite his enthusiasm about e-commerce, however, Mr Ong plans to keep his six brick-andmortar outlets to provide an "omni-channel approach to sales". "I think online customers feel more assured because they have seen our brand around. It gives them more confidence to make the purchase online," he says, adding that online shoppers are given a $3 voucher to shop at Mimosa's physical outlets. 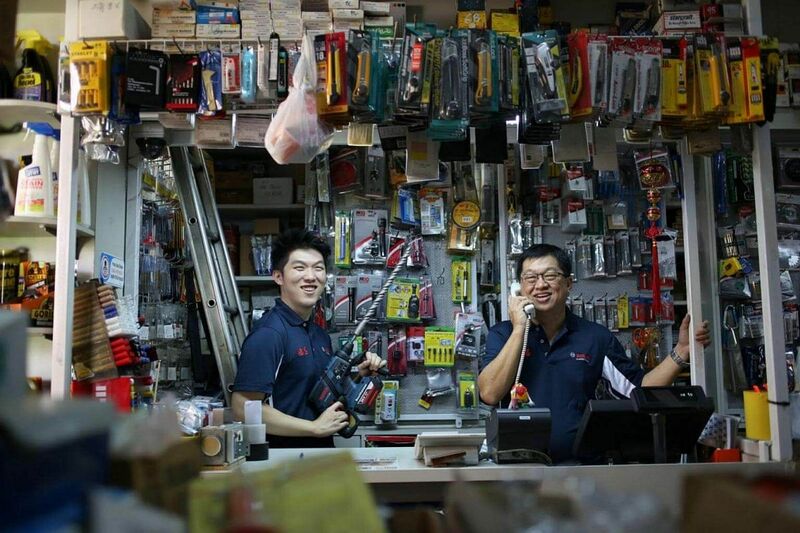 When it participated in Lazada's Online Revolution sale on 11.11, or Nov 11, for the first time last year, Teck Cheong Hardware, which sells power tools from its warehouse in Ang Mo Kio, saw a threefold increase in orders placed. The company had heard about the 11.11 sales frenzy in China, "but we didn't expect that it would have such a huge impact in Singapore as well. We were caught by surprise", says its business development manager Jayden Oh. This year, it will not be caught out - the company is doubling its stocks and making space in its warehouse for them. And to attract more sales, it will be offering discounts of up to 50 per cent on the site, up from last year's 30 per cent. The online push is spearheaded by the 26-year-old Mr Oh, whose great-grandfather started the business in 1965. But the idea of taking the business online came jointly from himself and his father. "We have to adapt to changes in market trends," the younger Mr Oh explains. "Going online gets us exposure and attention from customers we were unable to reach in the past." He wasn't sure how to go about doing it. We had to ask him to try purchasing items online. Their regular clientele consists of contractors and industrial businesses. But now, they have expanded their product range to meet the demand from new groups of consumers reeled in amid the online shopping wave. For instance, they now offer smaller, portable tools to cater to crafters and DIY practitioners. Evolution is not new for Teck Cheong Hardware. The business grew from a pushcart hawking used tools in the Sungei Road area. Another local family-run business, Winning International, which sells camping equipment, is also ramping up for 11.11 - a charge led by its founders' young successors. When Mr Terence Tan, 24, and his sister Tricia Tan, 25, began to take an active role in helping to run their parents' company, they introduced lifestyle products such as beanbags and travel gear. To prepare for the online sales period across various e-commerce platforms, the brand - with five stores in locations including Lot One and Westgate - is stocking up on its most popular items, such as luggage and sleeping bags, and offering discounts of up to 20 per cent. It was only in April last year that it entered the e-commerce sphere by setting up its website, www. winningmktg.com. It also began selling on platforms such as Qoo10, Lazada, Shopee and ezbuy. "Sales were starting to get a little stagnant. We were looking at platforms and avenues for growth," Mr Tan says. Although his father, who started the business in 1991 in the Beach Road area, was open to the idea of going online, "he wasn't sure how to go about doing it". "We had to ask him to try purchasing items online. He purchased a phone charging cable - a small item," Mr Tan recounts. Now, his father is a convert. He realised that items move faster online than at physical outlets, says Mr Tan. "We have more exposure as well. We have had people at our stores telling us that they saw our products online and came down to check us out. It's good to hear this kind of feedback."